5 Mar :As uncertainty continued on India getting back Mahatma Gandhi’s personal belongings which are up for auction in New York, PM Manmohan Singh has stepped in directing that all possible steps, which may include entering into the bidding process, should be taken to procure the memorabilia. Minister of State for External Affairs Anand Sharma has said that Prime Minister Manmohan Singh has directed that all possible steps, which may include entering into the bidding process, should be taken to procure Mahatma Gandhi’s memorabilia. Meanwhile, India has rejected the conditions set by the American auctioneer of Gandhi’s personal items for stopping the memorabilia from going under the hammer, and is in touch with United States and international legal agencies to get the articles back. "Prime Minister has directed me to do whatever possible….the bottomline is to procure the memorabilia," Culture Minister Ambika Soni told reporters as Government made last ditch efforts to stop the auction of Gandhi’s personal belongings. "We will enter the auction if required as a last resort" to bring back the items to the country, she said.Asked whether India would go for bidding if it failed to prevent the auction, Soni said our attitude is to avoid the commercialisation of Gandhi items as it was against Gandhi’s thinking." Pressed further what India would do if talks with auctioner fails, she said "as a last resort we would acquire the items through bidding. "Otis has expressed readiness to negotiate and donate the items to India if it offers "something very generous" to its poorest people. The memorabilia is up for auction at Antiquorum Auctioneers in New York.Rejecting the conditions set by him, Sharma said, "Gandhiji himself would not have agreed to conditions. The Government of India representing the sovereign people of this republic cannot enter into such agreements where it involves specific areas of allocation of resources." Chatwal to bid for Gandhi memorabilia to bring them to India With "no progress" in stopping the auction of Mahatma Gandhi’s memorabilia, Sant Singh Chatwal, a prominent Indian-American leader who has apparently been approached by New Delhi, today said he and seven others will be bidding for the items to bring them back to India. "I will be bidding for Gandhi’s items. The auctioneers are going ahead with the auction…. I feel there is no progress in stopping the auction," Chatwal, a hotelier with links with Democrats, told the news agency from New York.Chatwal said he does not know the price of the items and the Indian group was willing to pay ten times the estimate of the lot. 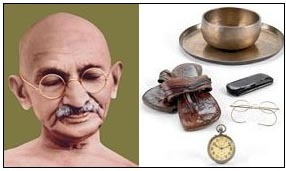 Gandhiji’s personal belongings – metal-rimmed glasses, pocket watch, a pair of sandals, a plate and a bowl owned by James Otis will be auctioned at the Antiquorum Auctioneers in New York. "We will be physically there at the auction though it is an online auction. I need to see the progress myself. The price is going up and up, who knows what is going to be the price". "We are chipping in as a community, we are eight… I am sure James Otis is trying to maximise the money for these items. Our idea is to get the items and bring them to India, we will not keep them," he said.